From our online publication to our very first FabFitFun box, it’s been such a privilege to see how much the membership has evolved in the past eight years. And as we’ve grown, our member base has become unique and incredibly diverse, so it only felt right to redesign our logo to reflect that. After multiple discussions and reviewing countless iterations, we came down to this fun, less rigid logo to represent what FabFitFun is today: your easygoing BFF. Want to learn more? Check out the evolution of FabFitFun in the video below. What do you think about the new logo? Weigh in on the comments below! Hello, I was one person that you said my name as a winner in one of the game shows back in February and I seem like not getting to you with my information where to send it to?? It was February 14-15 and I have the video to prove it?? I have left all the above and many messages with this company but I keep get told to type in this site but yet no mystery gift?? I need some help!! Thanks Susan Koch Tiseth!! Hello, I need help with wanting a game contest I won in February!! When I first saw the new logo I thought, Wow!I love the fluidness of it. It is whimsical,playful & feminine. I could not recall what the old logo looked like. Then I watched the video to recall the old logo. I also read lots of comments from other people. I agree with the people that said the old logo had a font that was easy to read, it stood out,it was neat & clean,all of that is true. It was also boring.The new logo is artistic, fresh,pretty,vivid. The new logo gave me goose bumps of excitement. I am 48 yrs young & I love the fresh new logo. The old logo was nice too & why can't you use both? LOVE IT! Very Springy and Fun! Love it! The logo looks so fun (pardon the pun). I work with fonts every day, all day, and this change misses the mark. Think of these fonts...Coca Cola, Apple, Google, and Disney. Your original stood out like those examples. It’s part of their brand, just like the old fabfitfun font/logo. So many have said it before me, old logo = clean with sophistication AND fun. New logo = sloppy with immaturity... it feels like a teenager’s bedroom looks. It definitely wasn’t broken. Hope you guys get it worked out, for your customers and especially your brand’s sake. I don't mind the logo change. Just don't ever get cheap with the contents in the box and keep the box pretty because most of us reuse them. Thank you! Not a fan at all. If it's not broken, don't fix it. Bring back the original logo. I agree with many others, I like the old logo much, much better. The new one is pretty but it doesn't have the sophistication like the original. I love the new logo. It is whimsical and feminine and stylish. Fun. Not childish. Not pre-teen. Not hard to read. I honestly don't like it nearly as well. It looks less sophisticated to me, but I still love the company and can't wait to get my next box. and I am sure it will grow on me. As long as all that fff stands for stays the same it's good with me. Wow, lots of opinions over a logo. I like both. As long as the box is great, who really cares about the logo? I just appreciate fff and their efforts to try new things. I'm sad to see the Original Logo GO :( This feels a little immature for me. I'm pleased I became a member before the logo change. I probably would have steered away from joining the FFF family. I'm sure I will get use to it or just ignore the logo as long as the fabfitfun quality standards stay the same or better. Have a fabulous day all. I think your new logo is dreadful. The old one was eye catching and fresh, this new one looks so sloppy and unfinished. It almost looks like you tried to scan a scribbled note, and it didn't pick up on all of the letter edges correctly. I also feel like you are trying to market this to a certain age demographic and this misses the mark completely, as it would appear more to tweens/teens. Is it too late to switch back? IHOP(B) did it. Sorry folks, this misses the mark for me based on what you were going for. The old logo was GREAT. It was bold, eye catching, iconic. This new one is more difficult to read, and has a much more immature, vibe. It also seems very "flirty" and "froo froo" which to me does not exude the same confidence that I have always associated with fabfitfun. This feels very middle school for me ... and no woman 18+ wants to feel like we’re back in middle school... this is just sloppy. No thanks. Maybe for a young preteen and teens subscription box?? I preferred the clean, classy look of the other one. I think this would be a good logo if you were creating a separate box for tweens and teenagers. I loved the old logo it was crisp, clean and eye catching. The new one seems childish, hard to read and too cutesy. Aw! I LOVED the old logo. It was reminiscent of fashion print magazine headlines and high end styling- serif and san serif, like our graphic designer friend below :) this one misses your target market by twenty years, and it's going to be dated quickly. Please bring the old one back! I prefer the old logo. I don't see how the change has anything to do with diversity. I really like the design of the box, but I do not think I am a fan of the new logo. I am 21 and this logo reminds me of middle school when my friends and I would write our crushes name in a notebook. The font can be hard to read at times and while it looks fun, I do not really feel the new logo represents fabfitfun, this new logo looks childish and rash. I really liked the old logo it looked empowering and I loved the way the font was different for fit and this logo always made me think fabfitfun really was fab, fit, and fun. 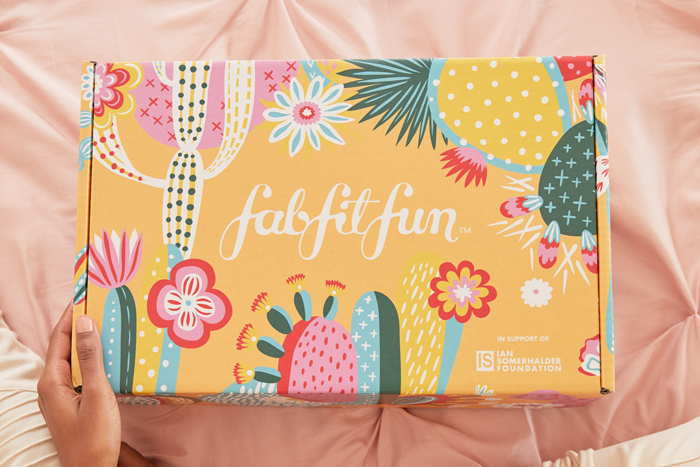 Its part of why I signed up for this box, it reminded me that even though I am an adult now I can still buy something that represents my personality and be fab, fit, and fun while doing it. I just hope the contents still stays the same, with great items that are currated for people wanting to try new things. LOVE this company, but unfortunately I am not a fan of the new logo. Looks very "teeny bopper". I liked the old logo much better. Sorry girls!! But the font is hard to read and looks like it’s geared towards teens! Loved the old logo 100x better. I love the new logo, it is a fresh take on the flowing curves of art nouveau. The background is a splash of happiness and color. I love the hispanic vibe! Well done!! I liked the old one! Loved the old logo !! It's a very pretty logo! Love the box and its contents! I can get over the juvenile change to the logo, but if the contents start to reflect the same change along with it, my subscription will be cancelled. My two cents, why do we always have to change things to have diversity? Why is that always brought front and center? I don't care what the logo looks like. It's all about the fun of getting a new box every few months. Diversity should not be a factor etc... you join FFF because you like it, or you don't join...that simple. My opinion of the new font? I don't care for it. I think it looks like a child wrote it. This new one seems to detract from the artwork on the box and looks like it is marketing to teens. I loved how classy the old one was! the old logo stood out and was fresh. however, i agree with those who say that it's what is inside that counts. i donate my boxes to the state facility that i work for. its a residential state facility for the mentally challenged. they use the boxes to put gifts in and the individuals who receive them love the bright beautiful colors. its beautiful to watch someone want to play with the box and not care what is inside. As long as what’s inside my box still comes with great quality & value is all that I care about. But I must say I did join because the old box caught my eye! This one I’d probably keep on moving on. Wouldn’t stop to look or buy!?!?!? I like the old logo much better. This one really does seem too juvenile but either way I LOVE FabFitFun! I also have to agree with the majority that the old logo was leaps and bounds better than this new one. The new one is hard to read and doesn't seem modern at all. This change really makes no sense to me as there was nothing wrong with the old logo and as far as I know, no one was demanding a new one. Please concentrate on the contents of the boxes and not this stuff. I really don't care in the end about the outside of the box, I care more about the contents of the box. Way to childish. Looks like a box I order for my 10 year old daughter. Needs to be more sophisticated. Not stuffy but what reflects the great items you have in the box which are high quality, this definitely cheapens the brand in my opinion. It's cute BUT the letters can be hard to understand what they are.. The F and the b. I prefer the old one! I think we can tell who learned cursive in school and who didn't by the comments. I think the new logo looks elegant and flows very well. The f's do not look like j's, they look like f's. If my opinion matters I say well done, and thank you to everyone who worked so hard on it. The new font is hard to read. If I saw this in a storefront I would think it is marketed to teenagers. Poor choice. Of course what matters is what is in the box. But if the box is a turn off to new customers they won't bother to look inside. When I first looked at it I read "jab, jit, jun". It is not quite as clear and attention grabbing as the old one. I also like how each work appeared more separate in the other logo. The new logo is sloppy. Why spend money on the change, put more quality item in our boxes. The quality of items recently has gone down hill. It’s more like junk in a box. Will be looking at canceling after subscription is up if quality isn’t better! While truly I care more about what’s in the box the logo I liked was the old one. I can barely make out what it says. And forget being able to read it from a distance. I think emphasizing the fit gave each sector of marketing its own area. Fab FIT Fun. The new one is messy. Sorry. I cannot stand the new one. It looks cheap and childish. I’ve been a FFF member almost since its inception, and it’s been going down in terms of quality lately (the last 2-3 seasons). This logo echoes that decline, not to the point where I’d stop subscribing yet, but it seems to be a downward slide they’re on right now. I actually LOVE the new logo! Not a smart change at all. I dont care about the logo, I care about what's in my box ???? Sorry guys, I’m not loving it either. Maybe for the future you could survey the subscribers with new design options and we could vote for you? Or maybe the next box can be a limited edition box with this new logo? I don't care what the logo looks like. It is the contents I focus on. It's a logo people... Love it or hate it, it changed. Move on to something that really matters, the contents. I never really gave any attention to the logo anyway. I love my box every single time and a logo wont change that one bit. Keep up the good work. I don’t really like the new logo. I find it hard to read. I definitely prefer the old logo. Not a fan at all. Loved the old logo. I think the box looks great, love the writing. To me it looks a little more grown up. Great job to all of you, keep up the good work ! I love the new logo! It doesn't emphasize just one word and the font is fun. Nice job! I LOVE the old logo better. It's easier to read and looks more professional. The new logo looks sloppy and hard to distinguish what letters they're supposed to be. Please keep the old logo. If it works, why break it! Nosey neighbors could see what the box said before, which prompted them to google and join up with you guys. (Cows didn’t just ask and get a referral. Lol). The NEW LOGO is a MARKETING BUST. The boxes grab attention, which prompt people to look, win...,but if they can’t read or discern what it says from sidewalk, that’s a fail. Oh, and all caps weren’t because I’m angry...it was to get marketing’s attention through marketing techniques. Not a fan of the new logo. Definitely sloppy and childish. Prefer the uniqueness of each word of the old which represents diversity much better. Bring back the old one!! Not a fan...not at all! Not really a fan of the logo. It seems sloppy and outdated. The font seems very childish and while cute I don't think it represents your brand. The original logo was fine. I think if you were to change anything you should stick with something with clean lines, a crisp legible font. Original logo is better. I think the old/original one is more chic and modern. This one was is not bad, just more on a cute scale. Please bring back the old logo. This one is terrible. No. The new logo is NOT an improvement at all. It is hard to read, it looks sloppy and messy, and it does not fit your target demographic.....unless you're seeking preteens as your base. The old logo was classic and classy, far more contemporary and fresh. Love the company, don't love the logo. I don’t like the new logo. I like the old logo much better. The new ne is difficult to read, childish and sloppy. New one looks fluid and fun. I’m not sure rebranding the logo after becoming so widely recognized was needed. I don’t think your old logo misrepresented the brand or the cominity it served. The new logo is very preteen / teen feeling. Let’s face it the preteen/ teen demo isn’t affording your subscription. This Is a little sloppy and less classy. Your company, your decision. Even though, I really like the old logo better. The new logo looks like the F is a J. Hard to read should leave what works alone. I dislike the new logo. It looks young, like the company is geared toward teens. It’s also hard to read and seems dated and uncool somehow. I understand that you may have wanted to switch so that “fit” was no longer standing out in a different font, but I can’t believe this was the best the designers came up with. I really like the spring FFF tote this season but won’t buy as I don’t like the logo at the bottom. Oh dear! I like the fun crisp look of the old logo. This new one looks squatty and hard to read. If you weren't familiar with fff, I don't think most people would be sure what it says. I am sad to see the change.???? Don't think I like it as much as the original, as an advertisement the words are hard to read? Triple love the NEW logo! Good job!! ???????????? Nope don't like the new logo!! If that's the box that comes with the logo. Not for that either!! It looks like someone got bored or had nothing else to do!! Had no attachment to the old logo but the new one is Terrible. Plus it’s mush mash...hard to read. The old one was better. It looks like a 13 year old girls version of comic sans or a runny attempt at brush lettering. I like the idea of all three words being in one font, but whatever this is, should not be it. It’s 70’s retro and I like it! Change is good! The company is already branded and will continue to be so there’s nothing to lose. Keep up the good job FFF! Yea....don’t like it so much. At first glance, the logo by itself DID look childish, but on the box with the rest of the pretty design, I think it looks very nice, and even better that the word "fit" no longer stands out. You can tell many of these comments are just copies of each other... "...elegant " or "...juvenile " I think the new logo represents the overall theme of the brand more so than the old logo. And I like that the new logo doesn't have an emphasis on the "fit" aspect of the logo. I kind of have to laugh about the logo situation. With the previous logo I always felt that the “fit” part was not me since I am not fit and probably won’t be in the near future. With the old logo the word “fit” really stood out with the italicization. The logo whether new or old is a hard brand name for me to even discuss with my friends and family because I usually stutter the words into something resembling fat-fib-fun... So who am I to say? I like the new logo. I liked the old one as well but the new one fits better. It's prettier and doesn't emphasize any single word so all three stand out. I don’t really like the new logo, it’s really difficult to read and it reminds me of the lettering on Hubba bubba gum wrappers. I am not a fan it is not a better logo than the original. Oki am going to be the lone wolf here and say honestly, I am not a fan of the old logo OR the new one. Old one seemed to emphasize the “fit “ word and the new one looks odd with all three words strewn together. Maybe if it wasn’t horizontal but more vertical. I don’t know just not a fan of either. Having said that I agree with talias02 if the stuff inside is great, it could come in a plain box and I wouldn’t care! I do not like the new one. It is hard to read. The old one was perfect! Why change a good thing? Please bring back the old one! I like the new logo but I LOVE the old logo! The new one seems a big juvenile and like something an elementary school child would use while picking out a font in Microsoft. As long as my boxes are still outstanding it doesn’t matter but the old logo is definitely where it’s at! I really preferred the clean look of the old logo. I think it better represented the classy and high quality we've come to expect from fff. Not sure why a change was needed, this doesn't give the same impression, less appealing as marketing text for me. I would interpret it as cheaper image branding, too bad the value in the original was overlooked. I am turned off by the new logo. It is hard to read at a glance, whereas the original logo was easily read in an instant. I feel the original logo was fun, classy and hip. This new logo looks childish and basic. I suggest you bring back the original logo because it looked better with your stylish artistic boxes. I feel this new logo cheapens the look of the artwork on the box. This was a fail, but can be easily corrected. I truly don’t understand why so many are so upset... it’s words on a box. As far as I’m concerned, it’s what you put INSIDE my box that matters. You could send it’s contrnys in a plain, brown UPS box and I wouldn’t care. ??????? ?‍♀️ Just my thoughts. I hate to use the word “iconic”, but if ever there was an appropriate time to use it, it would be to describe the distinctiveness of the original FabFitFun logo, which I loved. R.I.P. to the logo I fell in love with. It’s like when you’re in a relationship and your elegant, empowered partner has a midlife crisis and decides to dress like a hipster to appear more youthful; you still love the person, but you miss the person you fell in love with and hope that they resolve whatever crisis they’re in.. and soon. Old logo was better. Please listen to your community and bring it back! I always loved your old logo. I'm surprised you changed it. I guess I've seen worse but the old one was perfect. Have you ever heard that phrase... “if it is not broke, don’t fix it”? Why would you change your logo? BRING BACK THE OLD LOGO PLEASE! The old logo met more styles and personalities! I don't like the new one at all. The old one was way better. No idea why you felt the need to change it. I vote change it back! Like the old one better. This looks like 13 year old wrote it. I agree with the majority. The new logo is too uniform. The old one had more character. Not a fan of the new logo. Please bring back the old one! I personally like the old logo better. It matched the brand more and is more fun, yet classy! This new logo makes it look cheap. Please go back? Love the old logo... simple clean and just visually appealing. This one is somewhat messy and not the greatest typography. Brush script is super hot right now, but this looks a lazy version of what’s trending... maybe trying to take the trend and make it “different” back fired ????. Try again or just stick to what has been working. The other font was fine!! I like the old logo much better! Classier! Not a fan of the new logo. The old one had a nice touch of class. The new one looks like you’re marketing to pre teens. I like the old logo, very much! Terrible idea to change it. Not a fan of the new logo. Definitely prefer the old one. Not a fan of the new logo. I prefer the other one so much better. Wish I could have weighted in on this decision. I do not care for the new logo at all!! Why would you change it and especially to this short, messy font??? Well your asking. I like the old logo better. I am in my forties and the new font seems like something too young for my age. The brand seems to cross over many age groups currently. Be careful slippery slope and there are many other subscription boxes out there now. Not a fan of the new logo. It’s so bland and unappealing. They need something that is more legable and complements the company. The old logo did that. Old logo was way better. This is blobby and hard to read. Can’t say I love the new logo. Nothing makes it pop. But it is what it is- it’s changed. I like the original logo so much better! It was distinctive and classy. This Is just cursive writing and being all in lower case is hard to read. My only thought is that the “fit” font was different and someone complained. Logos are meant to be unique. This looks like the logo committee just didn’t care. Hate the new logo. The original is terrific! Gotta say I agree with the majority here.... The old Logo is better. Maybe if it wasn’t all in lower case it might look ok but ... it does look a bit juvenile. Perhaps a pre-launch pole would have been a good idea. We get to be involved with other choices regarding our FFF boxes ????. Still love all of my goodies and I’m definitely not going anywhere. Can’t wait for my next box. ???????????????? Sorry, it's a total miss. Your brand is growing by leaps and bounds with the first logo. The original logo was exactly as the company name intended - original! You should never mess with something that is truly successful. The new logo does not denote originality in any way shape or form. It appears juvenile and the font is hard to read. New logos should only be created when a brand needs to be overhauled to breathe new life into a declining company. However, if you're considering offering a separate subscription box to anyone under the age of 18, the new logo could work. Good luck! Unfortunately, I liked the old logo better. It was neat and clean, but also strong and fun. It was also much more eye-catching. I understand the reaction to update the logo, but I really felt like you had it right with the first one. This one seems a little more sloppy and not as appealing. I liked the old one better as well. I think the new logo is spirited and carefree just like the FabFitFun members. I prefer the old logo as well. It was modern and sophisticated. Not loving this new one that much. I love the new logo! ♥️ I anticipate getting my boxes so much that I upgraded my membership so I wouldn't miss a thing! Keep up the good work Triple F!???? I am not a fan of the new logo. The old one looked much nicer, neater. This new one looks like sloppy writing. I honestly really like your old logo better than your new one???? It’s a logo. It’s fine, who cares? I don’t need a say so in this, as long as the box is still great! I definitely prefer the old logo. I’m not picky on either logo as long as my box is amazing ???? Sorry,folks. Preferred the old one and don’t get why you changed. I prefer the original logo, it seemed more sophisticated and it was easily recognizable. The new logo doesn’t come off to me as “easygoing” but maybe just a bit cheap :( Hopeful that FFF won’t lose it’s quality. Definitely prefer the older one. The new one looks like it’s targeted to high schoolers. I prefer the old logo... it’s more elegant and you’ve built the recognition... why change? The new logo is fine if your rebranding and marketing to a younger demographic.. I like the old one. It was easy to read and I thought the font style stood out more than this new design. Someone may be regretting their decision right about now. That’s tough. No. Don’t like it. Looks like a middle school doodle. I love the new logo and don’t understand the negativity people are dishing over the change. It’s simply a logo, people! Even if I hated it, I’m not paying for the logo so why complain about it? Please bring back the original logo. I loved it. I associated that logo with the excitement of recieving my box. It definitely made a bigger and bolder statement! Sorry, but it’s a miss. Looks sloppy and juvenile. The tails are just too thick. The N a bit too flowy. I see. “dab dit dum”. Not sure how it reflects a more diverse client base unless you just mean a younger client base. It’s not as bad in the white on the box but the black just looks messy. I prefer the old logo. It Is more sophisticated and classic. The new logo has a more playful appeal. I wish subscribers could have voiced their opinion before the changes were finalized. I love the new logo. Y’all could do no wrong in my book. I think the updated look is fantastic ???? I like the old logo better. The new one is hard to read. Old logo.....BAM, in your face...the words all stood out. New logo...lazy just dragging itself across your vision. But hey, you must have a method to your madness. And new logo isn't going to make ne stop getting my boxes. New font kind of makes it look cheap. Something young and not sure of themselves. The old one was bold and distinctive, and reassured me I was making the right choice with subscribing to the box. I like the old one a bit better. I like the new one just fine. I liked the old logo and I like this one! I say, change is good and adventurous, just like FitFabFun! I prefer the old one...more elegant. I liked the old logo a lot better. It has a classier, more modern feel and made me happy and excited just seeing it! The new one just looks messy and juvenile to me. Can you bring back the old one? Why change a good thing? ??????? ?‍♀️ I think you nailed it the first time so why change it? I agree.I like the old one better.I see no reason for the change.Hopefully it will be an amazing spring box. I prefer the old one and don't understand why you would change a well recognized logo. New one is innovative and I like it.... but at first it seemed to say... dabditdun instead of fabfitfun. Fix it and you have a winner! I prefer the original logo without a doubt. The new one has a juvenile look about it, and it looks like the ink blurred or something unintentional. The old logo was strong and distinctive, while still slightly feminine. This one is way too highschoolish and immature. I loved the old one! If things are working for ya, why change. Love the new one, great job team FFF! I prefer vthe original logo without a doubt. The new one has a juvenile look about in, and it looks like the ink blurred or something unintentional. The old logo was strong and distinctive, while still slightly feminine. This one is way too highschool and immature. Old logo. Too band you changed it just to change it. No longer distinctive. Love it. It looks bright & fresh! I like the new logo! Nice little change up! old one was easier to read a made a bold statement. I preferred the old logo, it was fun, but yet strong. It was definitely attached to the brand. I think you might have done your brand a deservice with the logo ???? While I’m new to you all, I think the old logo was distinctive. The new logo looks like a hotel logo and to me it is cheap, including text that doesn’t stand out. Unless you bought tons, why not say you goofed and go back. I absolutely ❤️❤️❤️ the new logo! It’s fresh, softer and more modern! Great job to the designers! I’m actually preferring the old logo. Good effort though with the change. Logos need to be updated every once in a while to reflect the modern time. However, the only thing that bothers me about the new logo is that the bottom loop on the "f" is backwards, making it look like a kind of script "d". I prefer the old one. Don't really like this at all. It looks like someone livetraced something in illustrator. Def coulda came up with something better in a college art classroom. But I still love the boxes so you do you! Definitely liked the old logo much more. It was very identifiable. I love the old logo more.... this one look smaller and chubbie but more feminine. I don't like that the letter F is going down now..... A letter F that goes up will make me more happy. Old one is better in my opinion. I also prefer the old logo. I thought the old one stands out more- you can read it clearer! This one's cute but the old one stands out better???? I love the cursive idea, but this logo looks a bit sloppy. I appreciate your effort! Still love the contrast between the words on the old logo, the previous version is number one for me. While the logo is already changed, I hope the contents of your boxes will stay just as awesome as before! The new logo gives me a 70s vibe, while the old logo seemed more modern. I don't have a preference. They both seem great. New logo is very light & fun! I love this new logo! Well done, FFF! I ❤️ The new logo! It flows and isn’t as stiff! Definitely much more fun!